Judy Faulkner refuses to sell Epic and has told those whose will control the majority of shares after her — her heirs and the board — not to sell or go public. I highly doubt that drowning in a sea of Apple cash would be her preferred way to go. 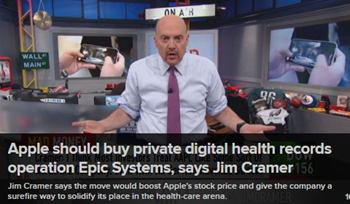 Cramer thinks Epic needs scale, which they don’t — Epic makes billions with a few hundred boutique customers and doesn’t care about millions of app users paying $2.99, social media platforms counting ad clicks, or illogical fanboys who buy overpriced Apple devices as soon as they’re released. Cramer wants Apple to smooth out its hardware vendor market bumps by buying its away into the software market, a strategy that has failed other desperately growth-seeking companies countless times. Apple’s consumer innovation track record died with Steve Jobs, but acquiring Epic to leap headfirst into healthcare won’t make a dent in the real problem of flagging IPhone sales in the absence of any other compelling offering. 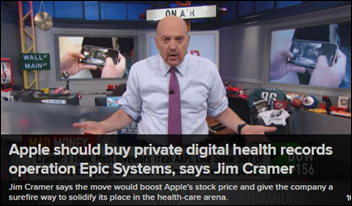 Cramer claims that Apple and Cerner practice information blocking (which is a stupid thing to say since it’s their customers that are the problem – providers who want to exchange information do so easily) and proposes that Apple become a universal repository for health data. 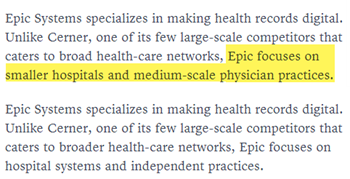 Apple doesn’t need to buy Epic or anyone else to accomplish that, and it’s a weird thing for Cramer to say since he just got finished saying Epic and Cerner aren’t interoperable. Notice the before-and-after result (above) of the show having to alter Jim’s inane comment that Epic focuses on small hospitals. The top version is the original cached version, while the bottom is a post-surgical shot after Jim’s foot was removed from his enlarged mouth. (I reviewed the show video and he really said that Epic is a small-hospital vendor while Cerner focuses on big ones). From Jelly Doughnut: “Re: population health management. Why isn’t it used more if it really saves money, which it should?” Because it saves money years down the road for someone else when the patient / enrollee has moved on to other insurers and providers. 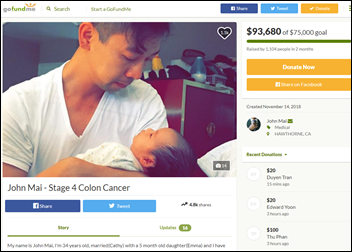 A company spending big dollars today to help a 30-year-old patient get healthy will most likely never see the benefit. We probably need some kind of lifetime patient financial scorecard to fix this, yet another healthcare example in which taking better care of people means making less money. The only real exception is with lifetime insurers such as Medicare and the VA, which get to reap the benefit of whatever savings they create. From KC1981: “Re: Cerner. Is offering ‘voluntary’ retirement packages and is making it clear that if that doesn’t get to the total numbers needed, the next step is forced retirements and layoffs.” Unverified. I’ll get a call in to Jim Cramer. From Nicholas Cage-Free Eggs: “Re: HIMSS ‘news’ publications. Down here in Australia, HIMSS dismissed the award-winning contracted editor of its flagship publication after she ran an insightful, critical overview of the problems with the Australian Digital Health Agency, whose CEO is a friend of HIMSS CEO Hal Wolf. That CEO threatened to withdraw sponsorship of the HIMSS AsiaPac conference. Now HIMSS won’t run stories without the agency’s approval.” Unverified, although I’ve heard that before and the editor’s LinkedIn shows that she did indeed leave a few weeks after her story ran. It’s not exactly ProPublica over there – they should have made it clear they weren’t looking for actual news and hired a marketing person instead of a journalist. From Acute Malcontent: “Re: social media influencers. 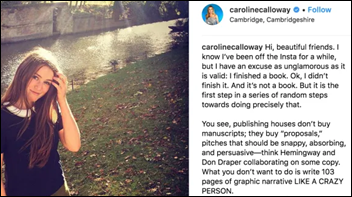 There’s something to be said for the HIT crowd that seems to exist only on social media, but meanwhile, I thought you’d get a kick out of this story.” Instagram influencer Caroline Calloway – who in her mid-20s took a $500,000 book advance that she couldn’t pay back when she found out that she can’t actually write – suddenly announces after a two-year hiatus that she’s offering a national “tour” in which she will instruct attendees (at $165 per head) how to create an “Instagram brand.” Twitter roasted her for trying to recruit free helpers, arm-twisting Philadelphia and Boston ticket-holders to travel to New York City instead to make it easier for her, giving attendees packets of flower seeds instead of the promised live orchids to wear in their flowing locks, and letting 20-year-old friends with no work experience run the show. She cancelled the rest of the “tour” and claims in Fyre Festival style that it’s not her fault and she’ll give refunds. Jezebel concludes, “No one is an influencer if everyone is an influencer.” I would add a health IT corollary – you aren’t an influencer, even in its most shallow form, unless you change the behavior (especially the buying kind) of people with real influence. 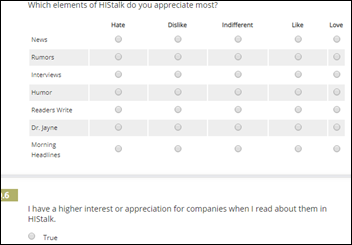 It’s that just-before-HIMSS time when I ask you to take three minutes to fill out my annual reader survey. I use the results for several things – to plan for the year, to manage my ego up or down as needed by reading the positive and negative comments, and to get a mental picture of who is out there on the other side of that blank screen that I vanquish every day. Dear overzealous sales types – if you connect with me on LinkedIn and immediately spam me with a boilerplate sales message, I will instantly remove the connection, overriding my initial impulse to report you for spamming. I know people told you to Always Be Selling, but that means you are Often Being Annoying and LinkedIn already offers plenty of that. 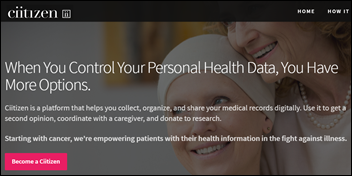 Consumer health data sharing company Ciitizen raises $17 million in a Series A funding round led by Andreessen Horowitz. CEO Anil Sethi founded the company in 2017 after selling a similar company to Apple for its health records business. Consumer healthcare website company Everyday Health Group acquires Castle Connolly Medical, owner of the Top Doctors database. PerfectServe acquires competitor Telmediq for an undisclosed sum. Telmediq founder and CEO Ben Moore will become PerfectServe’s chief product officer. Chris McMahon (Turbonomic) joins Kyruus as SVP of people. Health insurer Oscar names Angela Calman (IBM Watson Health) as VP of communications. ZeOmega promotes Sandra Hewett, RN to CNO. Todd Stottlemyer (CNSI) joins the board of Verato. Nordic hires Tom Kirst (Afton-Armitage) as managing director and special assistant to the CEO. PatientSafe Solutions names Kathleen Harmon, MS, RN (Sphere3) as chief clinical officer. Partners HealthCare chooses Visage Imaging’s Visage 7 enterprise imaging platform, eliminating multiple legacy PACS and giving the company the largest sale in its history. Williamson Memorial Hospital (WV) will implement Meditech’s Expanse EHR via the company’s subscription service. BridgePoint Healthcare (NJ) will deploy EHR software from HCS at its post-acute facilities in Washington, DC and New Orleans. Arkansas State Hospital selects EHR and RCM technology from Medsphere. Northern California behavioral health services provider Remi Vista selects Cerner Integrated Community Behavioral Health and patient portal. Texas Health Resources implements MDsyncNet’s physician on-call scheduling software at eight additional hospitals. Huggins Hospital and Catholic Medical Center of GraniteOne Health implement Oracle ERP and HCM Cloud. Managed care company NextLevel Health Partners signs on for PatientPing’s real-time care notifications. Critical Alert Systems will add real-time patient-generated data from medical devices and EHRs to its critical alarm surveillance solution via Bernoulli Health. In Canada, the New Brunswick Department of Health will spend $12.5 million to implement an EHR in three phases over the next several years. In Ontario, Health Sciences North works to recover from a computer virus discovered Wednesday morning that has affected several IT systems. A “major computer system breakdown” was also reported at Hôpital Notre-Dame Hospital in Ontario, though it’s unclear if the two incidents are related. 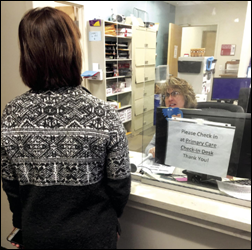 After going live on Epic last month, Memorial Hospital (NH) staff struggle to keep up with prescription refill requests as they transfer prescription data to the new system. The hospital has set up an “urgent refill” hotline and special walk-up window at the hospital for patients. It has also established a hotline for pharmacists having trouble with the system. Interim CEO Lee Myles admits the new system’s “complexity is amazing,” and that employees are working “ridiculous hours” to get refill workflows back to normal. 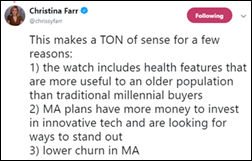 CNBC reports that Apple is talking with three Medicare Advantage plans about offering the AppleWatch to members at a subsidized cost. The $400 latest version of the Watch features senior-friendly fall detection. Skeptics have pointed out that more evidence is needed to determine the device’s impact on outcomes, and that seniors may have a hard time manipulating and reading the device’s small controls and display. Medtronic develops an app that, for the first time, gives users of its pacemakers the ability to pull data from their own devices. Coursera adds 100 healthcare-related courses to its roster of online classes, emphasizing healthcare informatics, management, and public health. 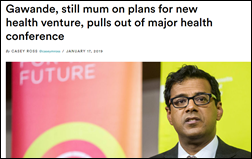 Atul Gawande, MD cancels his keynote at HIMSS19, which isn’t surprising given his media hiatus since becoming CEO six months ago of the joint venture between Amazon, JPMorgan, and Berkshire Hathaway. Maybe he’ll spend the time he’ll save naming the darned thing. Meanwhile, HIMSS announces that HHS Secretary Alex Azar will join CMS Administrator Seema Verma in a Tuesday evening session on interoperability and patient engagement that, based on their Twitter track records, will turn into a political rally. A 17-year-old teenager in China who sold a kidney to black marketers for $3,000 in 2012 so he could afford to buy an IPhone 4 and IPad 2 is now a 25-year-old man who will be bedridden and on dialysis for life after his remaining kidney failed due to poor technique in the illegal surgery. Five people, including two moonlighting surgeons, went to jail and Mr. Wang was awarded $300,000 in compensation. It’s probably not this Mr. Wang. Optimum Healthcare IT will host a HIMSS19 lunch and learn session titled “Optimizing Outcomes with Real-Time Data Harmonization” on February 12. Patientco adds financing options from ClearBalance to its SmartFinance patient payment technology for health systems. ZappRx partners with Bayer, giving it insight into the medication access and prescription habits of patients living with Pulmonary Hypertension, and with Relapsing Remitting Multiple Sclerosis. Elsevier Clinical Solutions releases a video summary of its recent Health Dialogue roundtable. Clinical Alert Systems partners with Bernoulli Health for real-time clinical surveillance, advanced analytics, and intelligent alert notification. Healthfinch will exhibit at the Allscripts Global Sales Kickoff January 22-24 in San Antonio. The InterSystems IRIS Data Platform is now available on the AWS Marketplace. Nordic hires Tom Kirst (Afton-Armitage) as managing director/special assistant to the CEO. 1. Will the screens of the new venture app become available for the public, or will both Apple and Epic UI/UX become a closely guarded secret ? 2. If there is a (God forbid / Unheard of…) bug in the new Epic Apple app, will a poor soul like a concerned RN or MD that will dare report about it – be sued into oblivion by Mr. Cook’s lawyers ? Seriously? Have you not read the post, and been sleeping under a rock in Healthcare Technology land? WRONG QUESTION. Apple could have had the long view to dedicate to enterprise healthcare long ago, but they were quarter over quarter focused. Epic had the long view, and it has resulted in it’s current value. “Healthcare” and “Health System Delivery” are very different, in general interpretation of meaning. Epic dedicated to the system. Apple did not. And cant buy it. that a lot of who the true students of the industry are, and how the majority are just riding the wave with very little true industry experience or foundational knowledge. “I’ll get a call into Jim Cramer” and “not this Mr Wang” are why this is the best-written newsletter in the industry! This is part of the reason that the “real” influencers HATE the term “influencer”, because the ones who actually create valuable content (which in turn can potentially be leveraged to drive certain purchases) much prefer the term “creator”. People who are creating artistic/insightful/valuable content (one whatever channel it is) generally are there for the creation of said content, and either (a) drive people to products and services that they really believe in and are passionate about because they use them and love them, or (b) begrudgingly partner with brands because they need to survive, and have to deal with annoying and inane requests from brand managers trying to get their talking points out. Either way, those real creators hate the term influencer because it cheapens what they do and the “influence” is a means to an end, not the end itself. People who consider themselves influencers or promote that idea are generally the wannabes in the first place that ruin it for everyone else. Re: Atul Gawande piece, heard an interesting NPR interview with author A.J. Jacobs who decided to thank every person involved in making his daily cup of coffee. The list is infinite. I think Atul Gawande will find the same, when tracking the costs, the list of cost centers can be daunting because there is a thread leading to more and more areas that are not obvious on the surface. It would be a good exercise nonetheless. A. J. Jacobs is such a thoughtful writer.